A many layered tale about a painting that a young chef, Annie, buys on a whim from a junk shop in London. Though she is working for two art dealers, she has no real interest in art, but is soon persuaded to try and find out the origins of the painting. 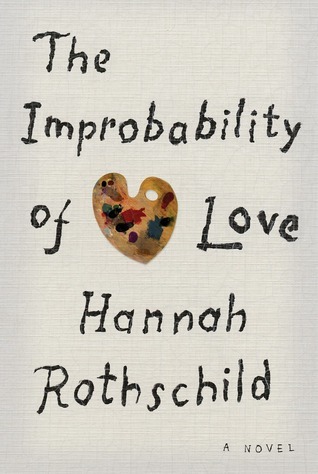 Meanwhile, a powerful art dealer, who built his family business as a German Jew who survived WWII, begins to desperately seek for a painting he had given a lover who unexpectedly died. Though his daughter doesn’t understand why this painting is so important to her father, she begins to search for the painting and begins to uncover the history of the painting, as well as that of her father. Suspense, a bit of romance, an array of interesting characters, and the history of an 18th century French artist all add up to make an entertaining tale. I recently finished reading Lucinda Riley’s The Midnight Rose, one of those dual timelines or two intersecting timelines, or (what I prefer) a dual story-line. This got me to thinking about how many such books I have read lately and why these dual story-lines have become so popular, and can they really be considered historical fiction in the truest sense? And how different are these from the traditional plot/subplot? For those of you who may be wondering what in the world is a dual story-line–it is two stories told in the same book or a story within a story. The stories usually take place in the same setting but with quite a few years (approximately a hundred seems rather popular) separating the two. Then there was The Bookman’s Tale by Charlie Lovett. An antique bookseller from North Carolina moves to England and ends up in a familiar quest to prove Shakespeare’s authorship. This book’s dual timeline goes from Hay-on-Wye in 1995 to the time of Shakespeare and is complete with both book and art forgers. Another four star for me. Two of my favorite authors who write the dual timeline quite well are Susan Meissner and Susanna Kearsley. My most recent reads from these two are: A Fall of Marigolds, (New York in Sept. 1911 and Sept. 2011) and A Desperate Fortune (London and Paris in 1732 and present day). These type of books are often listed as historical fiction, but I consider true historical fiction a work that is based on actual events and people. Both The Midnight Rose and The Lake House are totally fictional concerning their characters and events. I don’t enjoy them any less for that, and, of course, they are historical in the way they portray the ways people lived, the clothes they wore, the way they talked, used transportation, etc. What do you think? What makes a book “historical fiction”? And, do you enjoy dual time-lines? Read any good ones lately? Lately I have been reading several books of historical fiction from the era of WWI. I am currently listening to a Maisie Dobbs audio book, have started a Bess Crawford book on Overdrive, and last night I finished up The Summer Before the War. The Summer Before the War was a book that I felt improved and was more entertaining and engrossing as it went along. (So much better than one that starts out promising and then the ending disappoints.) It takes place in East Sussex in 1914, in the small village of Rye. The first major event of their summer is the arrival of Beatrice Nash who has come to apply for the position of Latin teacher. Many in the village do not approve of a young woman for this position; especially one that upon arrival turns out to be more attractive than expected. Beatrice is championed by a prominent woman of the village, Agatha Kent, whose husband works for the Foreign Office. Agatha has two nephews, Hugh, a medical student, and Daniel, a promising poet. Hugh and Daniel have differing personalities but are close and are both adored by Agatha. When Germany invades Belgium, Rye is quick to welcome refugees and, in spite of those who still believe war won’t come to England, the village prepares to support their country even if it means sending their young men off to war. Soon everyone in the village–the young the old, and all those in between–become caught up in a patriotic fervor. Of course, their young men do go off to war, and what happens to them and the ones who are left to wait for them makes up the rest of the story. Part of what interests me in reading historical fiction is found at the end in the author’s notes or acknowledgements. Simonson tells of the books she read to immerse herself in this period, as well as the websites and libraries. I love that she was able to read newspapers of the time (and took the trouble to do so). For those of you unfamiliar with Maisie Dobbs or Bess Crawford, they are both heroines of their own historical mystery series. The Maisie Dobbs books are written by Jacqueline Winspear and Birds of a Feather is the second in the series. I’m always looking for audio books with good narrators and a story that I can follow as I drive, walk, or cook. So far, this book has delivered with the excellent narration done by Kim Hicks. The Bess Crawford books are written by the mother/son team, Charles Todd. I have just started reading the second in that series, An Impartial Witness. A group I belong to on goodreads–Historical Mystery Lovers–will be reading a selection of your choice from Charles Todd during July, so I have a bit of a head start. If you’re on goodreads, check out the group and come read with us. Reading any WWI fiction or nonfiction? Let me know what you’ve read and can recommend. It’s a new year and goals and challenges are being discussed. Resolutions are still made, but usually with a sheepish grin. We want to change, but, being honest, we know how long, or how short, most of these will last. So, you can lose your weight, eat healthier, and exercise more, but being a reader, I am more interested in what other readers are doing and how I can challenge myself to read or to “read harder” as Book Riot has put it. I’m not really looking to read more, and will continue to read for pure pleasure and enjoyment, but adding a challenge to my reading will broaden my reading horizons. I have already decided I will read more non-fiction this year, and have started by beginning to read Hampton Sides In the Kingdom of Ice. Book Riot has issued their “Read Harder” Challenge which you can read here: http://ow.ly/FZLwd To read harder, you must choose a book that will fit within the 24 different categories they have presented. These categories include reading a book written by an author under the age of 25, reading a science fiction book, a romance book, a book written by an author from Africa, and a microhistory. Am I going to try and do all 24? No. For a couple of reasons. One, I have books I want to read just because I want to read them, and others I will be reading for various book groups, and I’m not going to put them aside just to participate in this. Two, I want a challenge, but not something that will take the fun and enjoyment out of reading. But, I am going to pick a few selections and make an effort to read those and join in with the group on goodreads. The first challenge is to read a book written by an author under the age of 25. I have a copy of Carson McCullers’ The Heart is a Lonely Hunter which has been languishing on my bookshelves for years. In fact, I had to do a bit of digging to find it. McCullers was 23 when she wrote this book, so I am choosing it to take on the first task. Another task (number 3) is to read a selection of short stories. 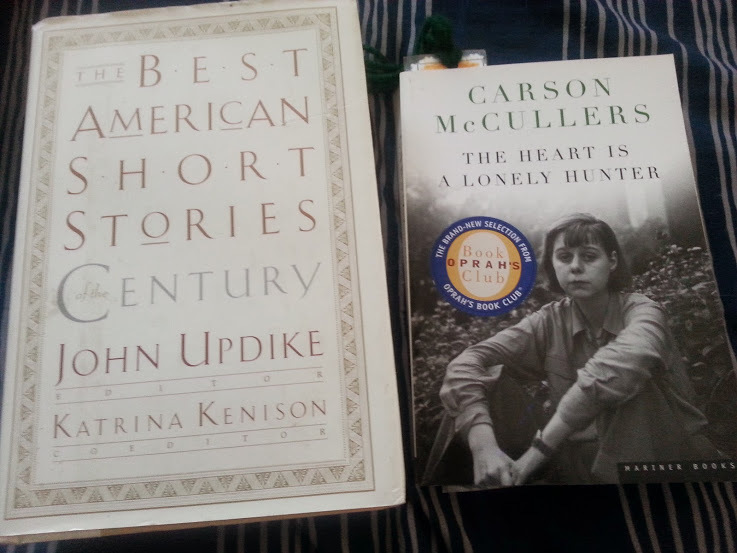 Another book I’ve had for awhile is The Best American Short Stories of the Century, edited by John Updike. Though I’ve read a story from it here and there over the years, I’ve never read it all the way through. Though I may take most of the year to get through it, I will begin to read it, keeping track of the stories as I read them (since I probably won’t read them in order). Some of the tasks I will be able to check off fairly easily as I go about my regular reading. This may seem like cheating, but, hey, it counts! For example, I have a hold on Overdrive for Nicholas Sparks’ The Longest Ride on audio. Once I get that and listen to it, I will have completed task 16 (audiobook), task 6 (written by a gender different than myself; i.e. a man), and task 13 (romance). What about you? Have you given yourself any reading challenges? Taking on any of the tasks from Book Riot? Or do you have a recommendation for a book from Indie Press? (That would help me with both tasks 4 & 18).